Another classification of causes - in general: Mitochondrial abnormalities (Frederich's ataxia, Kearn-Sayre syndrome), Fatty acid metabolism defects (Carnitine def, LCAD def, Glutaric aciduria type II), Myocyte protein abnormalities (DMD - Dystrophin, Sphingolipidoses, Fabry's disease, GM1 Gangliosidosis), Glycogen storage disease (Type IIa - Pompe's, Debranching enzyme def, III, IXb), Toxins (Alcohol, Cobalt, Anthracyclines, Anthrcyclines with adjuvants such as cyclophasphamide, etc. ), Viral infections, Bacterial infections (Rheumatic fever, Diphtheria), Parastitic infestations (Trypanosomiasis, Chaga's disease), Nutritional (Calcium, Copper, Iron, Selenium, Thiamine) and arrhythmias (SVT). 2 yr old, 10 kg. Unbalanced AV septal defect. s/p Takedown of Glenn Operation. Postop. day 5. On Epinephrine, Dobutamine and Milrinone infusions, Digoxin maintenance dose. Abrupt increase in heart rate from 111/min to 165/min. Initial diagnosis of SVT. Adenosine (1 mg) administration reveals multipe P waves. 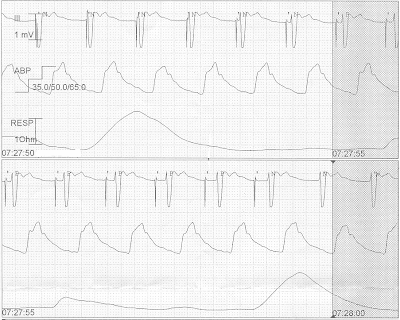 Atrial Flutter is treated with synchronized DC cardioversion (5 Joules). 2 year old, s/p heart surgery for complex congenital heart disease - having a difficult postoperative course. Upper panel shows a problem with pacemaker. This h been corrected in the lower panel. 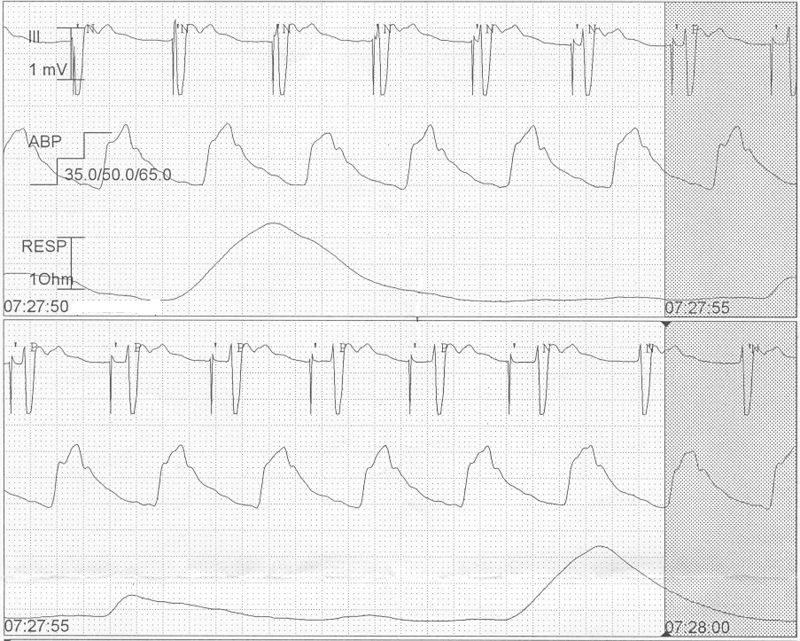 1) What is the pacemaker problem in the upper panel? Can you guess the pacemaker mode in the upper panel? 2) What adjustments in the pacemaker will rectify the problem? 3) Lower panel (recorded 2 hrs later): How is the pacemaker functioning now? What are the current settings in the pacemaker i.e. Mode, Rate & AV interval setting? Relationship of electrical to mechanical events. 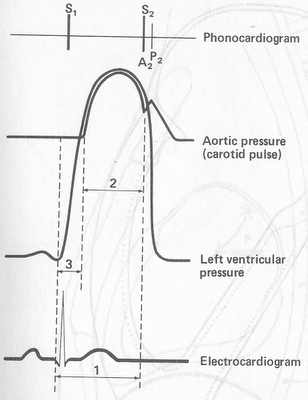 Note: Dicrotic notch in aortic pressure wave corresponds to aortic valve closure. 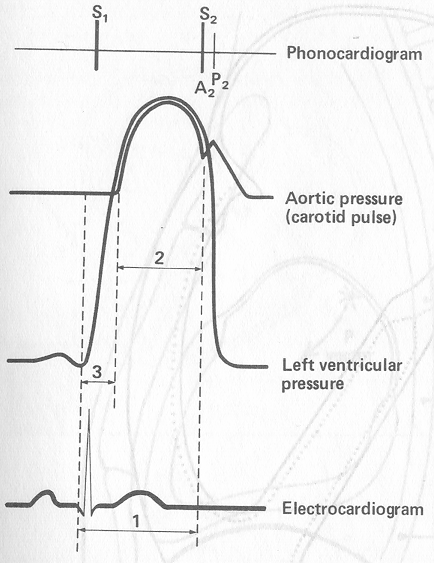 Portion of arterial waveform after dicrotic notch represents peripheral vascular recoil and reflection wave.